Subscribe to International Property & Travel Magazine. Established 22 years, a subscription to the bi monthly magazine focuses on high quality homes for sale from the UK and around the world in desirable locations. In addition a subscription to International Property Luxury Collection magazine features many interests related to the lifestyle owning beautiful homes provides. In each edition of a subscription you will also find coverage on travel, holiday destinations and resorts, interiors, cars, the latest exclusive fashion accessories, even super yachts and private jets occasionally feature. Whether you are looking for a highly desirable main home or a perfect second or holiday home, you will find page after page of inspiration with a subscription to International Property Luxury Collection magazine. Readers homes also appear and those with particularly interesting homes for sale are covered in great detail. Features are both informative and interesting, offering advice from leading property experts on current market conditions around the word as well as specific information on each destination. This includes suggestions on the type of leisure activities that can be enjoyed in the area, where to find the best hotels and restaurants and where best to indulge in a little retail therapy with guidance on superior shopping opportunities. We also have a regular spotlight on four selected luxurious resorts in the most amazing locations imaginable. Here the emphasis is on pure indulgence with money being no object magical retreats where you can relax, recharge and escape from the helter skelter of normal daily life. Unsurprisingly, International Property Luxury Collection attracts a discerning readership and can be found in flight and in the first class and business class lounges of British Airways, Emirates, American Airlines and many more leading flight operators. The magazine is also proud to be a media partner of the widely acclaimed International Property Awards and International Hotel Awards. The world's biggest and richest competition for leading property developers, interior designers architects and consultants established in 1994. 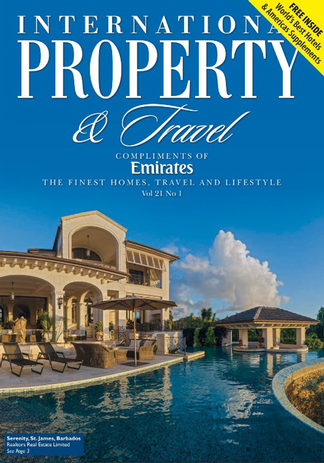 The award winning developers, interior designers and property agents appear in The World's Best and up to 4 editions of International Property magazine carries this showcase magazine as an insert free of charge.. International Property & Travel Magazine subscription.